Do you run your own business? When it comes to requesting payment from your clients you have to take to a self-employed invoice samples template. The invoice template lists all the goods or services that you have delivered to your client along with their proper descriptions. Besides, the invoice will also include the unit price and total amount that you are about to ask your client for the items or services that you have offered. You can also see Microsoft Invoice Templates. 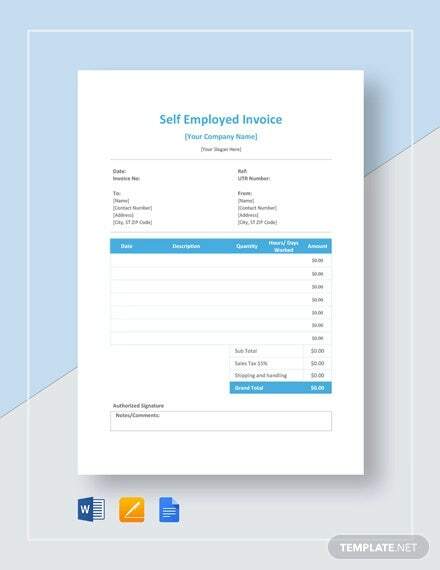 This is a practical and smart billing Invoice Templates that you are getting here, which would be useful if you are self-employed. It starts with an invoice number, date, followed by your business name, address, and other official details. There is adequate space to detail about the goods/services to be provided by you. 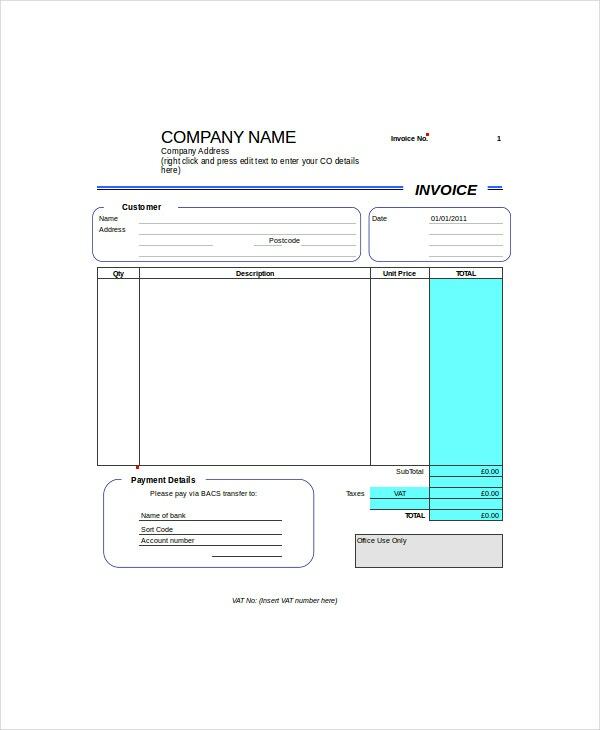 If you are looking for a standard column-based invoice template for your business, this would be the template for you. It opens up with the name of your company, your client’s details, followed by columns, containing all the standard sections that are usual in a professional invoice- such as quantity, unit price, description, and the total amount. 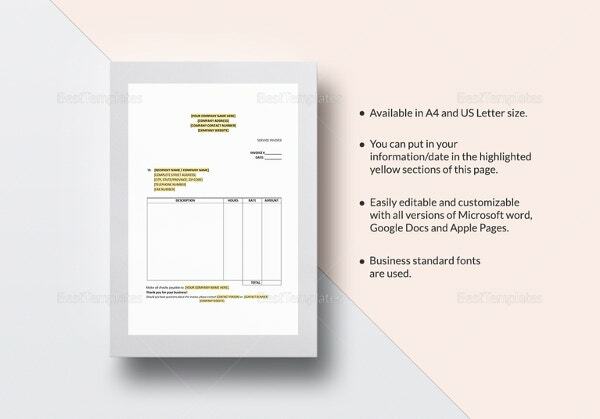 If you are in the construction business, your invoice needs to provide a good lot of space so that you can elaborate your work in detail and this is exactly where this template helps you. There is also a separate box for any notes you wish to add to your client, that would justify your invoice payment. You can also see Excel Invoice Templates. 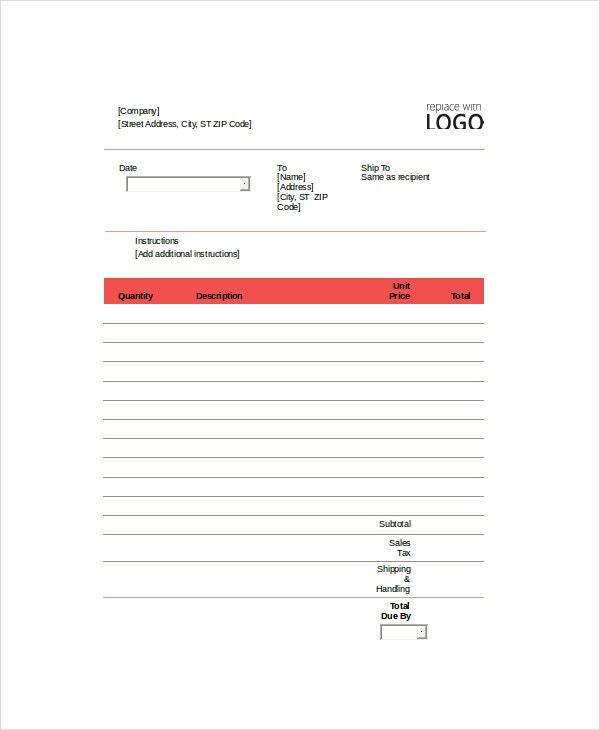 This invoice template is specially made keeping the contractors in mind. It comes with a simplistic yet smart structure, where you don’t have the columns but you still have the sections required for a standard invoice document, such as the quantity, description, unit price and total. The area under “description” is purposefully large to help with your elaborate notes. 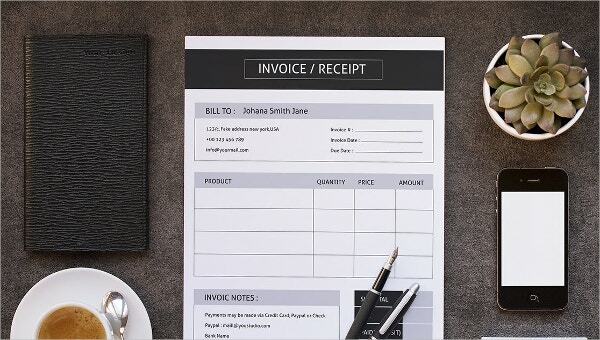 If you are a self-employed chef who charges fees as per hours worked, this invoice template would be the thing for you. The template comes with lines on the fees you charge for certain hours and you can easily customize the text with your own data. There is a separate area for your bank details as well which is not always available with other invoice templates. 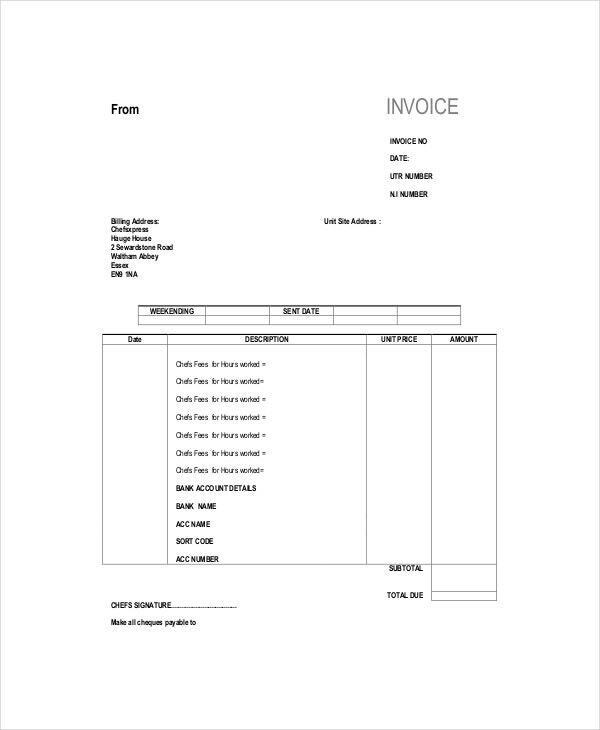 You can also see Commercial Invoice Templates. > What is the Benefit of a Self-Employed Invoice Template? 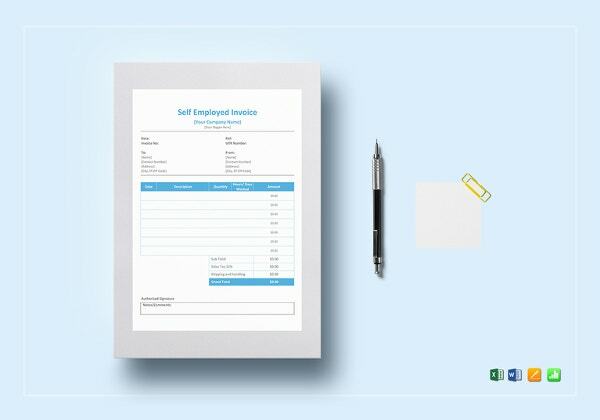 If you are into a business, a self-employed invoice template is a must when you are about to ask for payments from your clients. The invoice structure renders a professional look to your payment request and also enables the clients to check whether you have listed all the services/goods right and also whether the payment asked is at par with the payment agreed upon while settling the deal. 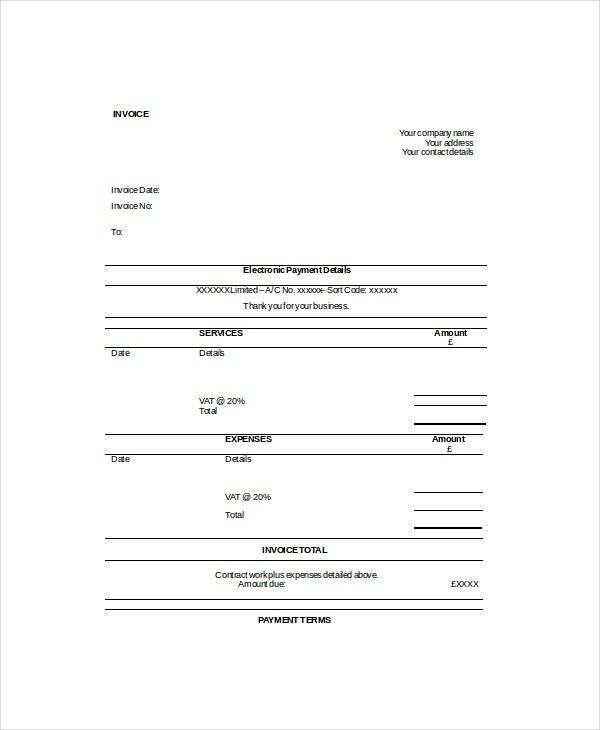 You can also see Education Invoice Templates. It inspires a sense of confidence in your client about you. Moreover, a self-employed invoice will assure proper organization of the billing system of your business. 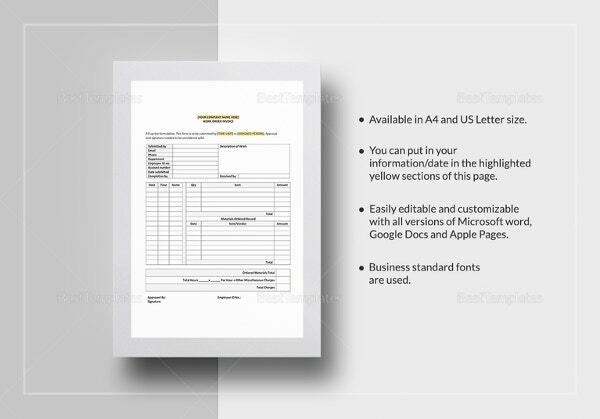 As these templates are available with ready-made sections, they make it easier for you to prepare the invoice form. > What Constitutes a Self-Employed Invoice Template? A basic self-employed invoice template is about the payment request made by a supplier to his client for the goods or services offered. 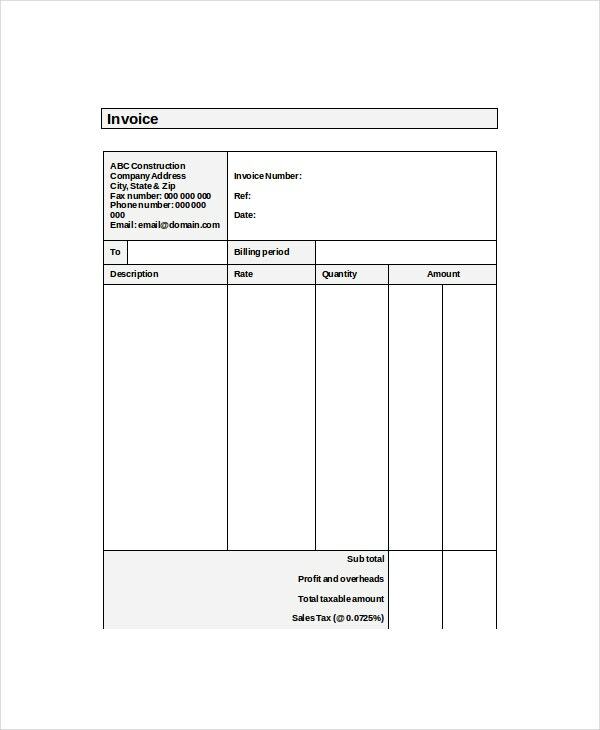 Thus, every such invoice template comes with columns or areas specifically allotted for the description and quantity of goods offered by the supplier. 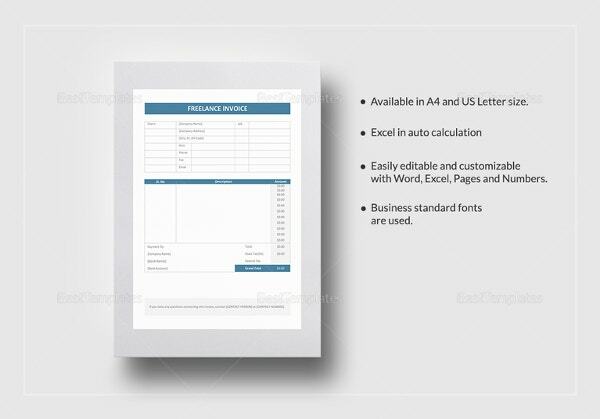 You can also see Proforma Invoice Templates. In the case of service-based businesses, the invoice template will have separate sizeable boxes to describe the whole service properly. The other important elements of the invoice template are the unit price, amount, total amount, details of both self-employed entrepreneur and client etc. Sometimes the invoice templates also have space to mention bank account details. > What are the Types of Self-Employed Invoice Templates? There are basically two types of self-employed invoice template. One is for the businesses dealing with goods and the other is for the businesses offering services to the clients. 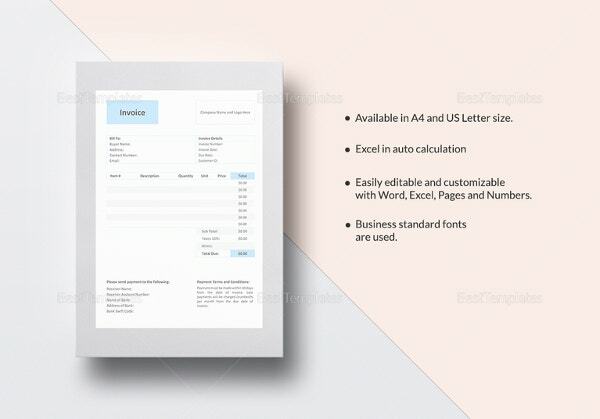 The invoice template designed for businesses offering goods generally follows a column-based structure with sections like quantity and description, added to the basic sections of price and total amount. You can also see Hotel Invoice Templates. 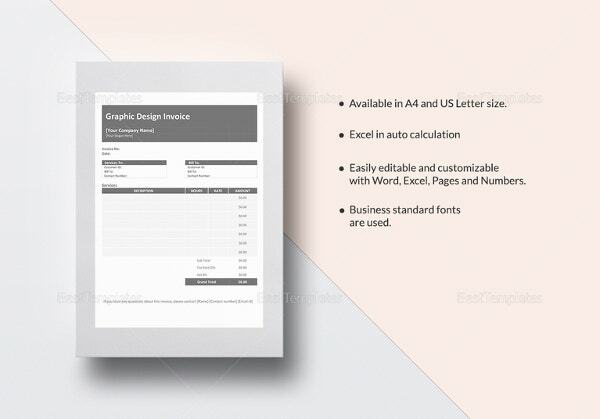 These templates are great for stationery suppliers, fashion stores and so on. The invoice templates meant for service-based businesses usually do not follow the column structure and would rather have elaborate boxes so that the services offered can be detailed neatly. These templates are for contractors, builders etc. Creating a self employed invoice for too many clients can be a huge burden when you have to handle most of the major operations of your business. It is in such situations that you would need an employee invoice template that comes with pre-set structures for invoice, which saves you from the trouble of creating the entire invoice right from the scratch.